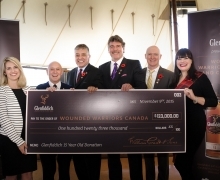 The artistic team of Winnipeg-born, self-proclaimed nomad, Rhonda Weppler and Calgary-born, Toronto based Trevor Mahovsky, has been awarded the 2014 Canadian Glenfiddich Artists in Residence Prize for their collaborative work that takes an innovative sculptural approach to still life. By combining handmade craft and improvised materials, their inventive work is an artistic translation of the complex identity of everyday objects as cultural artifacts. The pair's sculptural still life has been described as, "wickedly inventive, event-studded, inexhaustibly suggestive" and mesmerizing, beautiful and surprisingly profound. The Weppler and Mahovsky shared-win makes the pair one of only eight recipients in the world that have been awarded the art community's coveted 2014 Glenfiddich Artists in Residence Prize - to live and work at the Glenfiddich Distillery in Dufftown, Scotland. While in Dufftown, the artists live in crofts and are encouraged to find inspiration from the pastoral setting in the Scottish Highlands. One of the specific benefits is to work in an international artists' community, to share in a dialogue with one another and to foster cross-disciplinary ideas. The Glenfiddich Artists in Residence Prize covers the cost of travel, living expenses and working materials during the residency. 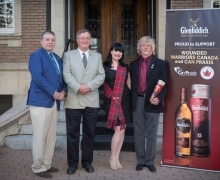 The three-month residency, valued at $20,000 per artist (or collaborative pairing), represents the Glenfiddich commitment to the arts and the communities it serves. The distinguished jury panel – Dr. Sara Diamond, president of Ontario College of Art & Design (OCAD) University, Gaetane Verna, director of The Power Plant, Kitty Scott, curator of modern and contemporary art at the Art Gallery of Ontario (AGO), Julian Sleath, programming manager of special events, economic development and culture at the City of Toronto, the Canadian 2008 Glenfiddich Artists in Residence Prize recipient, Dave Dyment – arrived at the shortlist of eight finalists and ultimately, Andy Fairgrieve, curator of the Glenfiddich Artists in Residence Prize, selected the 2014 Glenfiddich Artists in Residence Prize recipient. The Glenfiddich Artists in Residence Prize has sponsored more than 90 artists since its inception since 2002. Canadian artists include Daniel Barrow (2013), Jillian Mcdonald (2012), Helen Cho (2011), Damian Moppett (2010), Arabella Campbell (2009), Dave Dyment (2008), Jonathon Kaiser (2007), Annie Pootoogook (2006) and Myfanwy Macleod(2005).